EYP 5.0 is the City of Fremantle’s official Youth Week event. Can you believe it's been five years since the City of Fremantle opened the Esplanade Youth Plaza? This day is to celebrate this journey with a jam packed day of HEAPS of things to do. 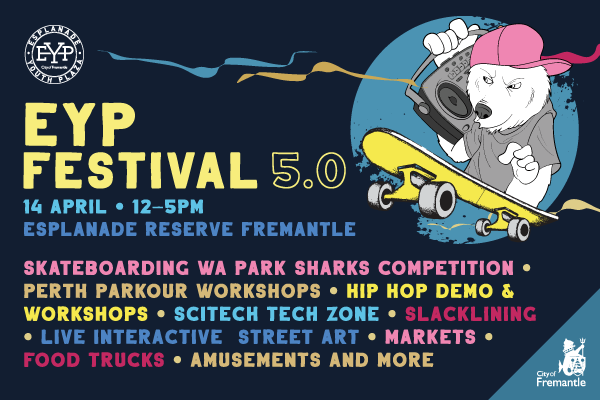 Skateboarding WA will be bringing the heat with the series final of the Park Sharks Summer Skateboarding Series. Plenty of action that only the EYP has with Slacklining (tight rope walking) and Perth Parkour workshops on throughout. Immerse yourself in Virtual Reality with Scitech’s Samsung Gear VR station! Supported by Oculus technology, these portable headsets allow you to explore fascinating new worlds all without leaving your seat (must be 13yrs+). Room Scale VR with the HTC Vive! “Tilt Brush” experience allows you to create 3D art all around you, where you can walk through your artwork, draw with sound, or fire, or even wander through a famous artists masterpiece! Are you game? Not for the faint hearted, “Richie’s Plank Experience” showcases just how immersive VR can be. It’s the safest way to test out your fear of heights! This Tech Zone is also with the Freo Library bringing the finest selection of Nintendo Labo action. Check out the inside of a real live ambulance with St John Ambulance, with the added bonus of not having to need it. Market stalls, food trucks from Red Tent Events and what would be a birthday celebration without cake! Most importantly come and meet the new Fremantle Youth Network members and let us know what is important as young people in Freo.